Is price a fair reflection of value? Now the summer window has closed and new signings are bedding in, it is a good time to reflect on the recent transfer activity. 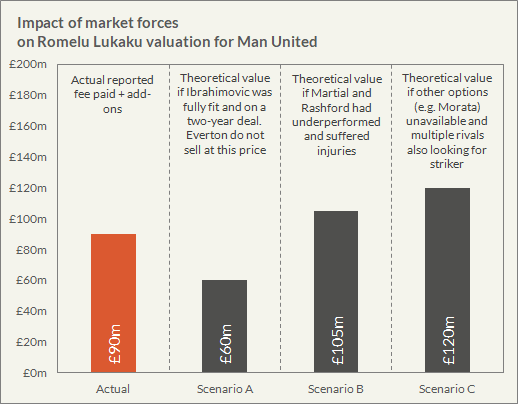 As well as the headline numbers, the variation in fees paid for similar players has given us pause for thought. The incomparable Mike Goodman wrote an excellent summary of the state of analytics *ahem* over at Grantland last week. In giving us a snapshot of the current advances in football analytics, Goodman makes the crucial distinction between data and analytics. As a rule, the former tells you what happened, while the latter helps tell you what, to varying degrees, will likely happen. To Premier League and Championship clubs, the September international break is football’s version of adverts only 10 minutes into a TV programme. At the very moment the season is beginning to feel like we all remember it to be, it’s ripped from under us for 10 days and we’re not always sure if we’ll like what we see on the other side.